The Christmas period was a busy one for events. The Christmas Countdown evening event was a massive success and raised £261.40. Many thanks to everyone who supported the event and to the nursery for providing all of the entertainment! The village lights switch on raised a further £88.90 and we have received generous donations of £200 from Wilsden Walkers, £500 from Wilsden Gardening Association, £500 from Wilsden Community Library and a further £1000 donation from an anonymous donor. A huge thank you to everyone! All money raised will go towards our 40 Candles refurbishment appeal. 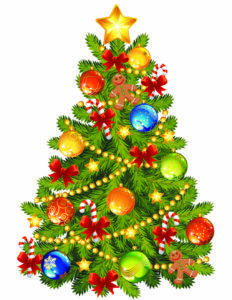 The village hall and nursery are currently planning to put on a Christmas event on the evening of the 30th November to raise some money for the 40 Candles Appeal. This will include ideas such as a live nativity, lantern procession and stalls/games. For more information see here. For this we need help from hall user groups and locals. Please contact us if you can help in the organisation or just on the day. 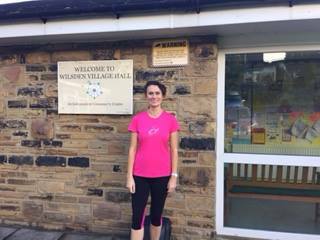 my last day at Wilsden Village Hall one to remember. group. Thank you for your kindness ,flowers and gifts. change.It has been full of laughter, challenges and many learning curves . funerals. Life at the hall has been anything but dull. I will miss the regular groups and people who just pop in. thank you for your support and trust in me. Lastly my family and friends who gave help, support and faith. managment committee and the capable hands of Mr Mark Driver. The winner of the raffle at last Saturday’s event was John from Aborglas, a regular supporter of our beer festivals, so well done to him! And thanks to everyone else who turned up to support the event. All money raised will go towards keeping the hall open so is much appreciated. 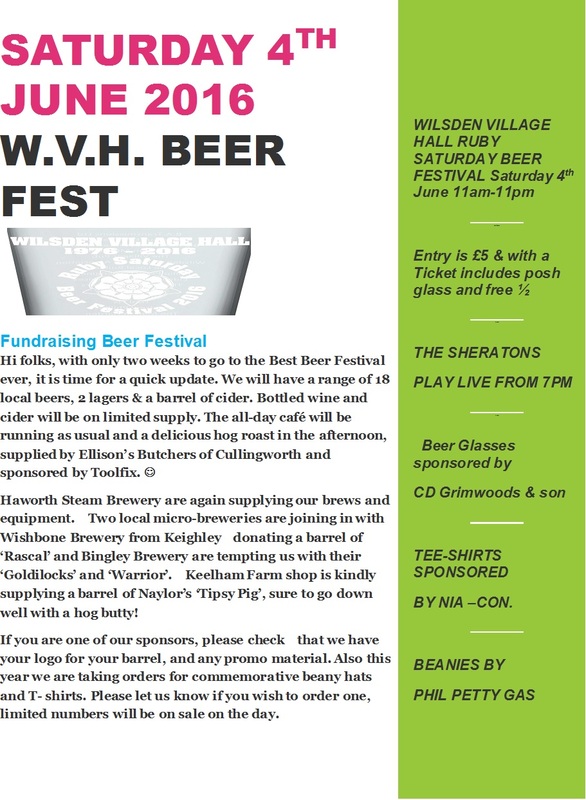 Tickets for next week’s beer festival on Sat 4th are now on sale at the village hall. These are £5 and will get you a free commemorative glass and 1/2 pint! Just a quick update on the beer festival on Saturday June 4th. 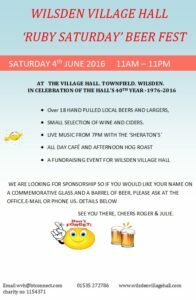 This year’s beer fest is set to be a great event as this year we are also celebrating the 40th anniversary of the hall. 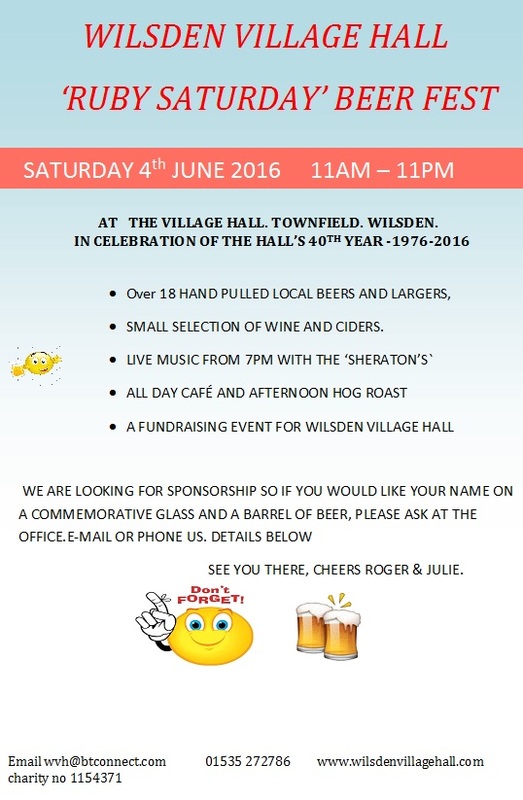 This is a fundraising event for the village hall so please support it if you can. Please note that the hall, school, after-school club and nursery are all shut today due to the bad weather. Youth Club tonight also cancelled.